Wednesday November 20th 1889 It was a delightful day. I got washing done this forenoon and Will cut up the hog they killed yesterday. In the afternoon we rode up to see about the cattle again and a man came while we were there who bought part Will would not take any of them. I worked all the evening cutting up lard. Charlie & Ida married five years. Thursday November 21st 1889 It was drizzling sort of day. I worked all day with the meat and lard and got it all put away in very good shape. We are tired and went to bed early. Will was fixing fence and working about the place. Friday November 22nd 1889 I hurried around with my work this morning and got the ironing done before dinner. Will and I went to town in the afternoon. Mother had come home and Edith come over with her to stay all night. We worked all the evening fixing mince meat. Weather quite cold. Saturday November 23rd 1889 We got our work done up in the forenoon so I went with Will in the afternoon to look over the Sangster pasture after that we went to town. I was at Hatties awhile. Mother spent the day down at Holsons. Will got the little cow he bought from Norahs home this evening. I did some mending and knitting in the evening. Sunday November 24th 1889 Mother went to church and down to Hatties for dinner the folks all came over with her for a call. I was busy about the work most of the day and in the evening Will and I went to the Christian Chapel to hear Bayard Craig tell of his travels in the Hold Land. a cold windy evening. 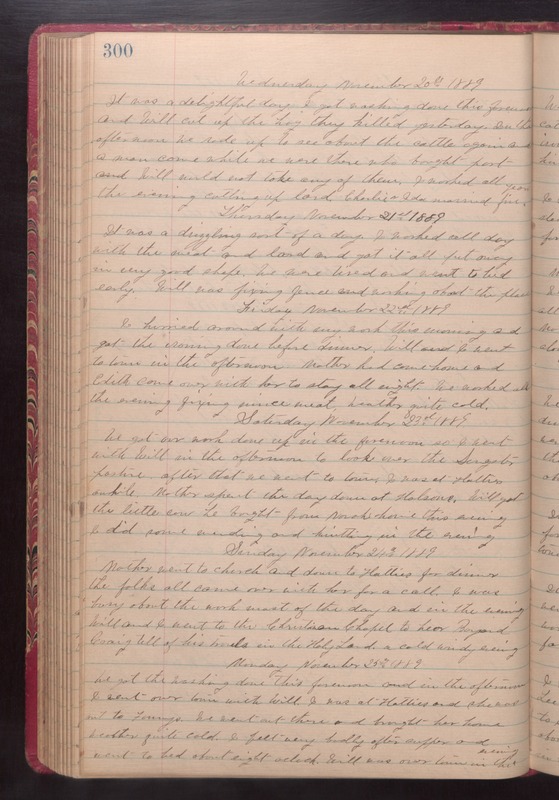 Monday November 25th 1889 We got the washing done this forenoon and in the afternoon I went over town with Will. I was at Hatties and she was out to Fannys. We went out there and brought her home. weather quite cold. I felt very badly after supper and went to bed about eight oclcok. Will was over town in the evening.